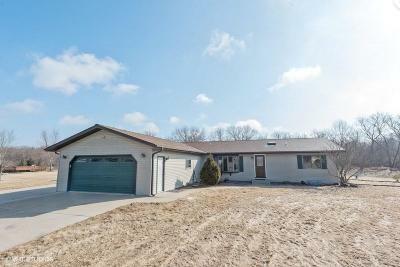 Exceptional find with this 3 bedroom 3 full bath ranch home situated on 2.001 acres. Step on in and find an open concept kitchen with island, dinette with patio doors to heated sun room, living room with gas fireplace and patio doors to deck overlooking private backyard. Master bedroom suite with double vanity, separate shower, whirlpool tub and walk-in closet. Spacious family room with bay window, laundry, 2 additional bedrooms and full bath make up the main level. Head down to the lower level and find a large rec. room and 2 office/bonus rooms. Separate stairs to the 2.5 car heated & Insulated attached garage. Storage shed Everything has been done for you, so bring your stuff and move right in.